Originally appeared in the November 21, 2012 edition of the Southside Times. You know the old adage about imitation as a form—nay, the sincerest form—of flattery, right? That sentiment is not unlike that venerable literary chestnut, as suggested by Saul Bellow, that a writer is a reader moved to emulation. Back in the summer of 2007 I had the opportunity to visit New Orleans; and when the most opportune occasion presented itself, I surreptitiously broke away from my traveling companions in favor of a solitary stroll through the city. I happened on a treasure called Cochon (French for hog or pig). After being seating and settling on a mint julep, I couldn’t help but start with a plate of the fried livers with pepper jelly and toast. Several bites into the experience, my impression was that the dish was an ingenious riff on the time-honored liver and onions. So—as my linguistics professor used to say—no tricks here, folks; this is a humble interpretation of an established classic from Cochon. Like most variety meats, chicken livers are absurdly affordable, making the magical transition from offal to awfully refined all the more impressive. And if you’re averse to variety meats, I urge you to try this particular variation. Who knows, you just might be moved to emulation. Happy Thanksgiving, dear reader—see you next week. 1. In a heavy-bottomed, high-sided stockpot (or home deep-fryer, if you have one), heat canola or peanut oil to 350°F. 2. After draining livers, place in a bowl and cover with whole milk; place in refrigerator and soak livers for 1 to 2 hours (this will draw out impurities, sweeten the livers, and help create a batter before frying). Meanwhile, pour balsamic vinegar in a medium-size bowl, and slowly whisk in olive oil to form an emulsion. Add salt, pepper, and sugar, and heat mixture slightly (either over a double-boiler or in microwave). Whisk again to maintain emulsion and pour over sliced onion; fold in parsley and set aside. 3. Place pepper jelly in a small saucepan over medium heat. Thin out slightly with a small amount of water (adjust consistency to your preference). Set aside. 4. Combine Drake’s with cornmeal in a shallow dish. In batches, remove livers from milk and dredge in flour cornmeal mixture. Deep fry livers until golden brown; drain on rack and season with additional kosher salt and pepper. 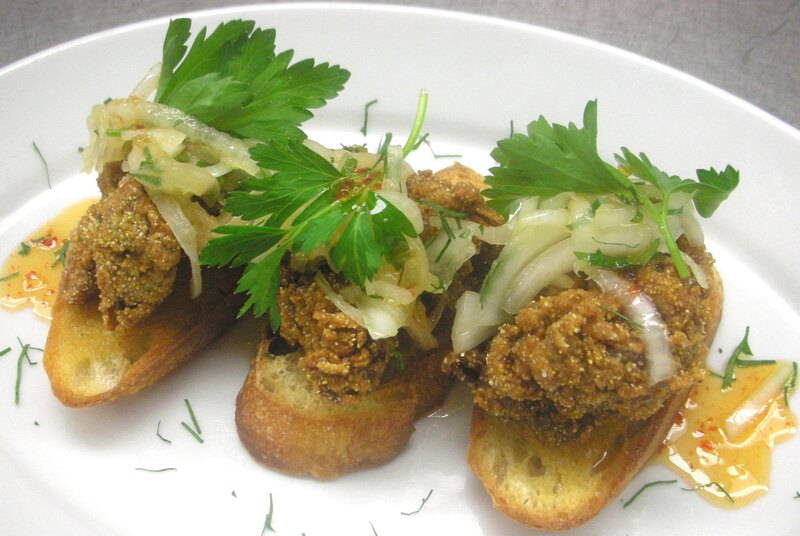 Serve fried livers on top of baguette toasts along with pickled onion, pepper jelly, and garnish with Italian parsley. Originally appeared in the August 23, 2012 edition of the Southside Times. Back in culinary school, I was acquainted with a jovial bloke who had a comical hatred for, what he called, “food on sticks.” I never really questioned my culinary comrade, just laughed along with everyone else at this particular idiosyncrasy. Otherwise admiring my friend’s insight, I didn’t necessarily agree with his take on skewered fare. For one, just about every noble cuisine has a version of the aforementioned execution—whether it be kebob (see also kabab, kibob) or satay or souvlaki; plus, cooking “food on sticks” can be a labor-light technique that yields savory, bite-sized servings. My cast-iron grill has accumulated some signature flavors over the years, so it’s the cooking device of choice when it comes to skewers. A caveat: Once again, this installment’s co-star carries the capability to transcend its side-dish status. 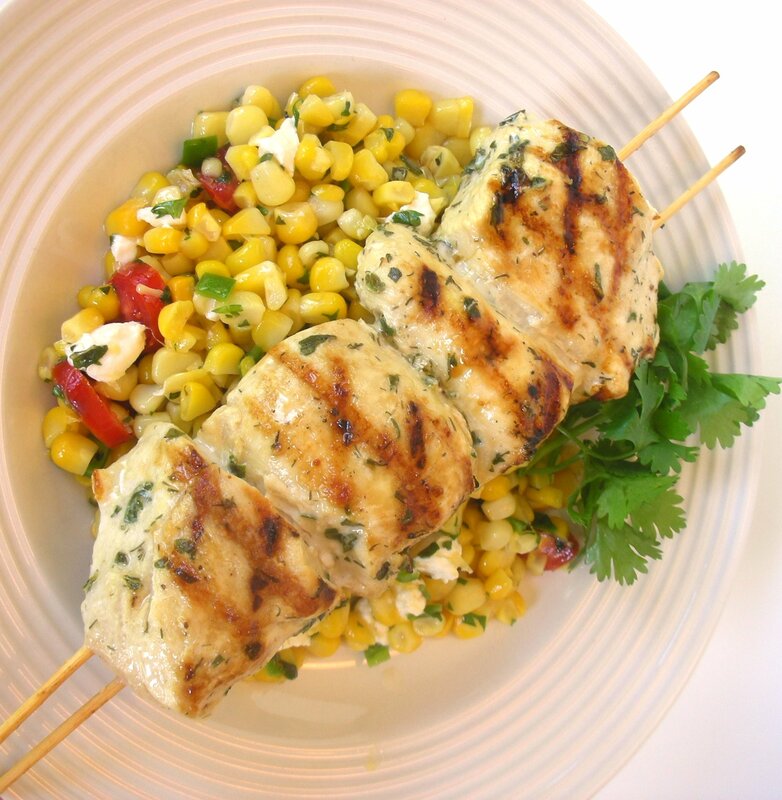 By not only complimenting the grilled chicken, the honey-lime corn salad is a pleasantly complicated recipe that you might find yourself employing over and over again either as a stand-alone dish, or pairing with a multitude of suitable proteins. So as long as the refreshing weather lingers, fire up your grill and break out your sticks. Don’t let the humble kebob get impaled by anybody’s bad rap. 1. 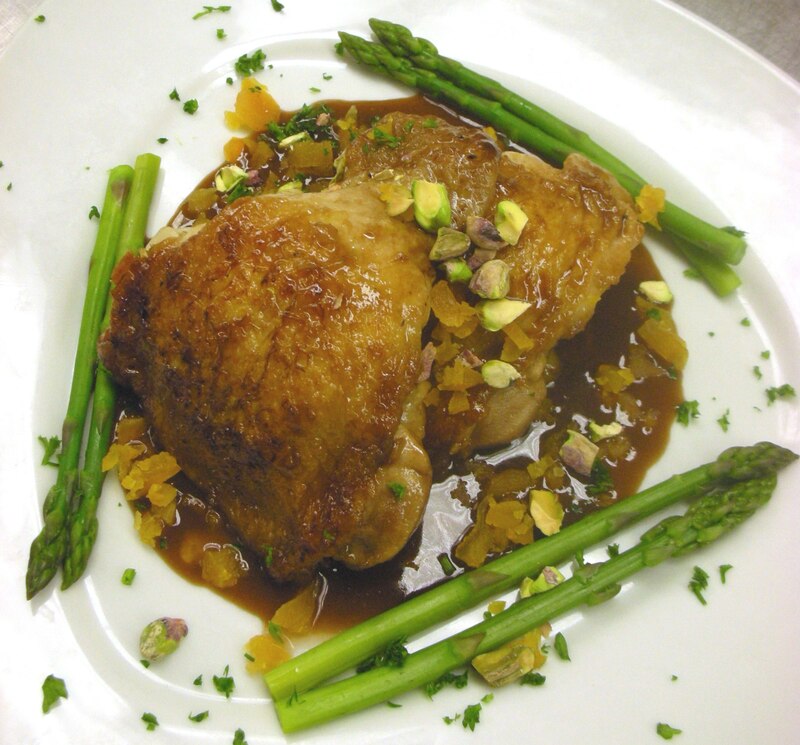 Cut each chicken breast into three large chunks and place in large bowl. Pour in enough olive oil to generously coat the meat; add fresh basil and dill and gently toss, distributing evenly. Allow meat to rest in fridge. 2. Meanwhile, bring roughly 1 quart of water to a boil, and add in ¼ teaspoon of baking soda (this will help soften the kernel). Add cut kernels to water, and cook for about 4-5 minutes (or until kernels are tender). Thoroughly drain corn and allow to cool in a bowl. In a separate bowl, combine lime juice and honey, and slowly whisk in olive oil to form a emulsion; season to taste with kosher salt and cracked black pepper. 3. Preheat grill. Remove chicken from fridge. Using four sticks, arrange several large pieces of meat along two skewers each. Season with salt and pepper and grill on all sides until meat is cooked; allow to rest. 4. When corn has cooled, add honey-lime dressing, fresh cilantro, cherry tomatoes, goat cheese, and gently fold together; adjust seasoning with salt and pepper. Serve with grilled chicken skewers. Originally appeared in the July 19, 2012 edition of the Southside Times. Most cultures have a mind-numbing variety of noodle or pasta dishes, but one of the most versatile and flavorfully complex is the popular Pad Thai. 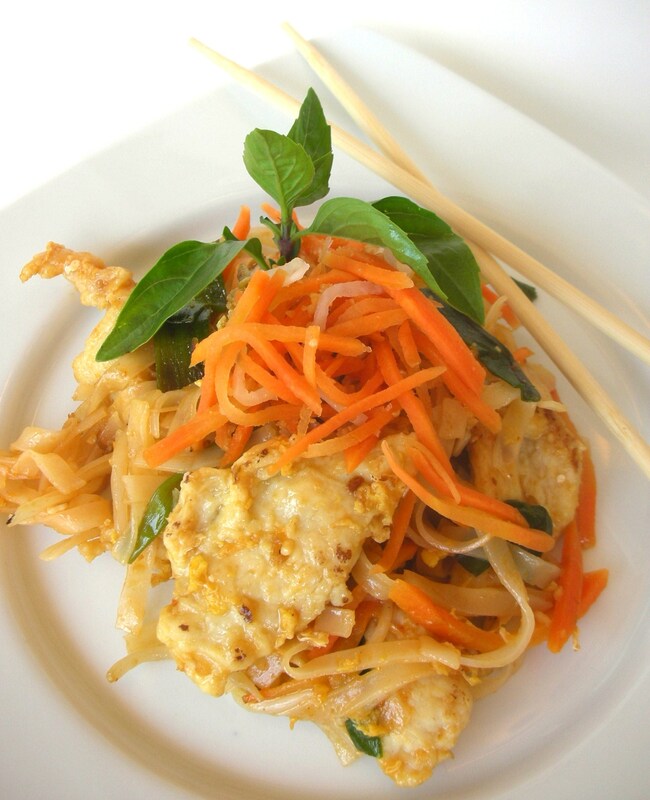 Pad Thai is composed of, well…it depends. Like many stir-fry specimens, the profile for pad Thai will have requisite variations, but it is the homogenous arrangement of often numerous individual ingredients that contribute to its singular personality. What you can be certain of is the presence of rice noodles, sautéed onion, perhaps some for form of protein (pork, chicken, tofu, eggs), with hints of citrus and sweetness along with a nuttiness from the oil and crushed peanuts. And then there’s the issue of heat. If you’re dining out, you can often request a heat level for many stir-fry dishes; but if you’re cooking at home, you won’t have that problem, will you? All it takes is a little Pad Thai tinkering and crushed pepper experimentation. My suggestion is that you take advantage of the season’s fruits and vegetables by incorporating generous amounts of citrus and fresh herbs (pad Thai is known for fresh scallion). Stir-fries are inclusive and unpretentious dishes, so approach this with a friendly attitude, because you should be prepared to share. 1. Soak rice sticks in bowl of warm water until soft (about 15 minutes). Meanwhile, combine fish sauce, rice vinegar, sugar, and ketchup in a small bowl. Stir until sugar has dissolved. Drain noodles—reserve until needed. 2. Heat oil in wok or wide-bottomed sauté pan; add chicken and sauté until meat begins to turn white; add garlic and cook briefly (don’t burn). Add fish sauce mixture, and bring to a boil; add noodles and gently toss with sauce. Continue to cook until noodles have absorbed sauce (about 2 minutes). 3. Pour eggs into the pad Thai mixture, and mix thoroughly until egg is set. Add chili powder or cayenne, along with scallions; cook until scallions are softened. Stir in peanuts and bean sprouts until incorporated well. Sprinkle pad Thai with cilantro, and serve with condiments.